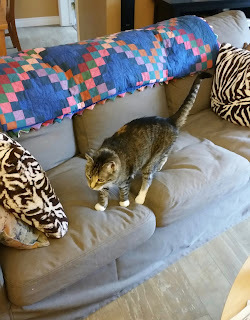 This post is about my cat Pippin. It's not about miniatures or board games or any sort of gaming. It's about my cat Pippin. I'm going to warn you now that this post has a sad ending, so if you're not interested or don't feel like getting upset then I'll understand if you click off this page. If you read this post, I'll appreciate it. When she was younger, like all cats she'd do her best to go everywhere. Here she is climbing on a fan. Not sure why but it doesn't look comfortable. My old desk used to have a shelf over it and for some reason she decided that it would be a great place to hangout and watch over me. And like all cats she'd try and drape herself over my keyboard. And also like all cats, she'd lie where you could rub her belly. One rub only then the claws come out! When I'd come home from work, she'd be there to greet me. She'd tilt here head looking for a head scratch then want to get up on my shoulder. And it was always my left shoulder. I didn't let her go outside unless I was right there. She would periodically race out when I opened the door and go down to the sidewalk and roll around. She really liked that. Here she is with a mechanical spider toy I got for Christmas one year. Not sure what to make of it. Pippin was really 'talkative'. 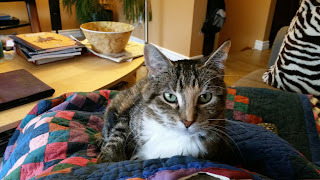 Whenever I'd call her name, she'd come to me with little meows or yips. It was almost like carrying out a conversation. Recently I noticed Pippin was getting rather thin. As she's almost 14 years old, I figured it was her just getting old. Regardless, I took her to the vet. The vet found a large mass in her lower intestine. It was almost certainly cancer. I took her to a specialist and it was determined to be lymphoma of the lower intestine. Prognosis was bad and the vet prescribed some pills that would at least help her eat better and give her a little bit more energy. So the past few weeks she was starting to eat better. She seemed to have more energy. Until today. When I got up this morning, she didn't come find me. I called out to her and she didn't come and not a peep. I was hoping she just got herself into a spot and couldn't hear me but realistically I knew what it could be. I searched everywhere and found her behind the freezer in the basement. She was sitting 'sphinx like' and didn't acknowledge me as I called to her. I knew that was it. I quickly grabbed a box and some towels, gently picked her up and raced into the veterinary hospital. Pippin hated riding in the car and would usually howl the entire time. This time, not a peep. The vet had a look at her and told me it was time. At 3pm today my little friend of 14 years died in my arms. Worst day of my life. Pippin the cat, 2002-2016. R.I.P. Been a while since I've posted anything up. I haven't actually done much in the way of painting lately as I've had other things on my mind. Regardless, I finally finished a few figures that have been on my desk for far too long. 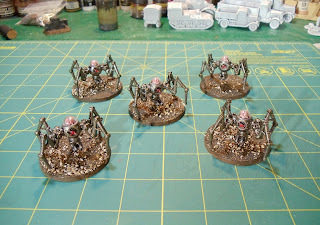 First up is a set of 5 mechanical spider walkers. These metal figures are from Bombshell Miniatures' Mekkus faction for their Counterblast game. They are called Mekkus Cybots. Next up is a trio of figures that can be used for Frostgrave. 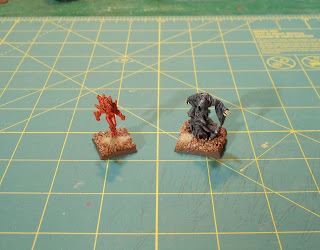 The first two are a Reaper small, metal fire elemental or familiar and a Frostgrave Frostwraith. Picture is crappy, but they look decent in person. 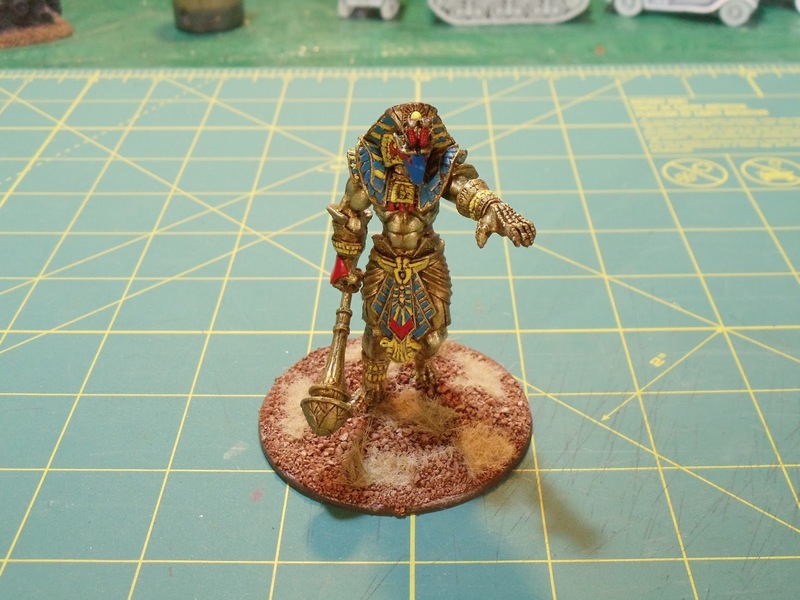 Next is a Reaper Bones Avatar of Sokar. Not sure why I picked this one up, I think I just wanted to paint it as I like the Egyptian theme. For board games lately, I've tried a few new ones out. 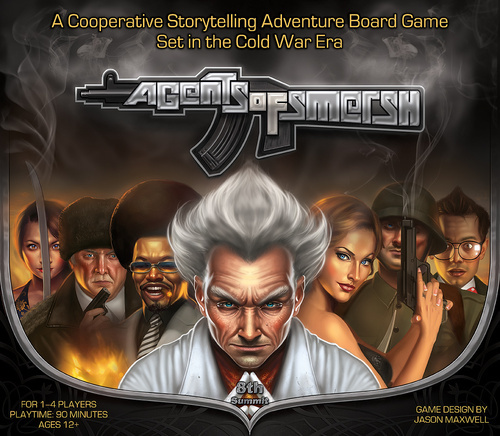 I picked up Agents of Smersh by 8th Summit. Fun game, not very hard, pretty easy overall. The story aspect of it is pretty interesting and pretty original. 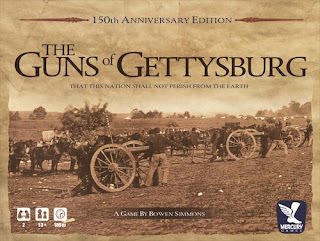 Another one I've played (solo unfortunately) is Guns of Gettysburg by Mercury Games. I've played one of Simmons' other games: Napoleon's Triumph and I find his boards are a joy to look at. Probably the best looking boards out there, especially for wargames. Excellent high quality components. I'd really like to give this one (or Napoleon's Triumph) another play. 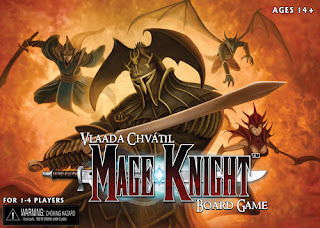 Last weekend, I also got in a game of Mage Knight by Wizkids Games. 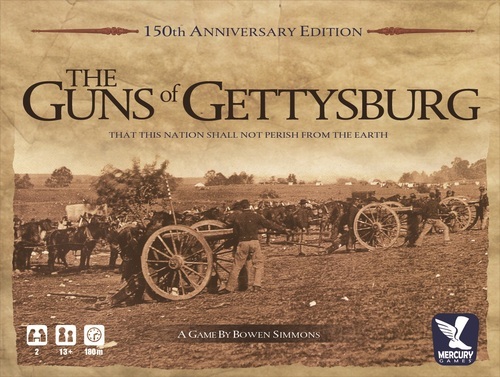 I picked this game up for a friend last year at Fallcon. It came with a couple small expansions. We finally got it on to the table and it's a pretty deep game. Not hard, there's just lots you can do. And lots of bits! I look forward to giving this one another try. Sitting on my paint table right now is some World War II French infantry and a bunch of French vehicles.